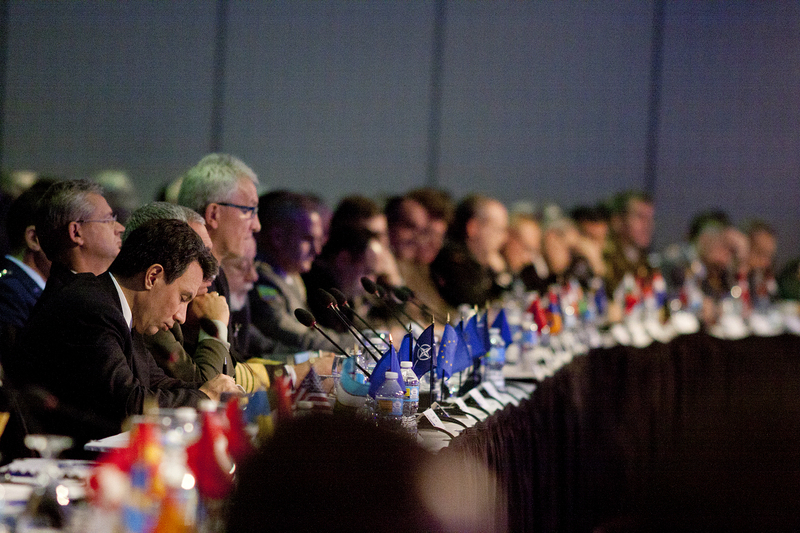 Military leaders with NATO’s Allied Command Transformation listen attentively to a conference panel on technology at NATO ACT’s annual conference in Norfolk, Virginia on Dec. 14, 2016 in the Norfolk Marriott hotel in downtown Norfolk. Photo by Malina Scacchi, Spartan Echo. The North Atlantic Treaty Organization’s (NATO) Allied Command Transformation (ACT) is holding their annual Chiefs of Transformation Conference (COTC) in Norfolk, Virginia Tuesday December 12, 2017 through Thursday December 14, 2017. NATO is made up of twenty-nine countries and promotes the freedom and security of its members through political and military means. Norfolk is home to NATO’s Supreme Allied Command Transformation. Allied Command Transformation focuses on executing initiatives designed to transform NATO’s military structure, duties and responsibilities. COTC is an open discussion with NATO’s partner nations and senior leadership to understand initiatives on future security challenges, innovation and transformation. The purpose is to create long-term development with these initiatives. This year’s theme is “Prepare for Tomorrow, Share the Future.” NATO’s leaders will be developing their leadership capabilities through syndicated topics that touch aspects of development, sustainment and operations. Students from Norfolk State University and other local institutions will have the opportunity to attend this conference. Participants will engage through interacting with a variety of world officials and listen in on select sessions held during the conference. Tags: Allied Command Transformation, Chiefs of Transformation Conference, COTC, NATO, NATO ACT, Norfolk, Norfolk State, North Atlantic Treaty Organization, NSU, Supreme Allied Command. Bookmark the permalink.